We traveled through the panhandle of Texas last week, covering most of the distance on the old Route 66. There are a lot of miles of the old road in the Lone Star state, although much is just frontage road for Interstate 40. But the small towns, and even the largest city, Amarillo, have the best original sections with roadside businesses and icons well preserved and in many cases, beautifully restored. 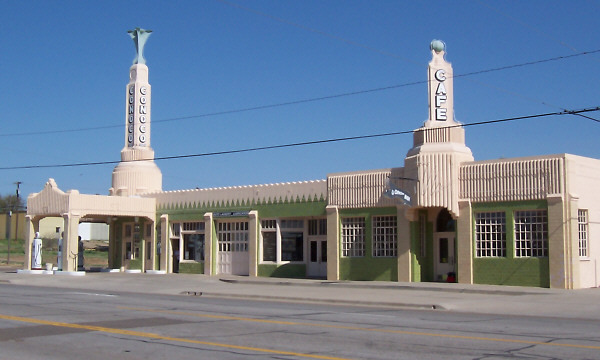 All of the pictures will be here in a few weeks, but for now here's one of a classic Conoco Gas Station and Cafe in the city of Shamrock, Texas. The restoration is excellent.